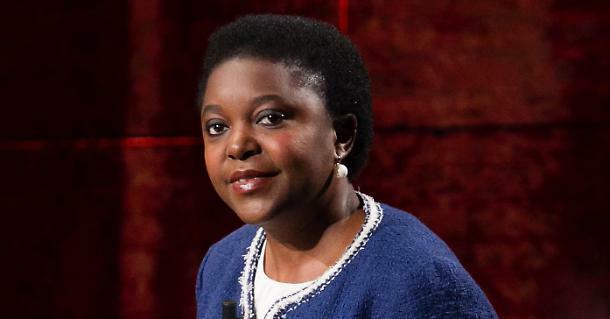 During an anonymous evening, in an equally anonymous place near Pavia, that is Borgarello, I casually took part at a meeting with Cècile Kyenge. She’s a woman that you don’t know much about, apart from the fact that she was Minister for Integration during Letta’s government between 2013 and 2014 and that she’s been victim of a sad remark by Borghezio, a member of the European Parliament from Lega, in 2013, who has been condemned just a year ago for aggravated slander with racial hate. Her name is Kashetu Kyenge and she was born in Kambowe, in the Congolese district of Katanga, from a wealthy family. She studied medicine and surgery and in 1983 she obtained a scholarship for the Università Cattolica del Sacro Cuore in Rome. Unfortunately, this grant didn’t arrive and she entered Italy with a visa for study purposes. She settled in Modena in a college for lay missionaries, and she worked as a caregiver in order to pay for her studies. She managed to graduate, with a specialization in ophthalmology. She gained the citizenship only after having married an italian man. For several years, Cècile contributed to sociality by working and creating no profit organizations, defending and being a spokesperson for immigrants’ rights. There were very few people at the meeting; with the mayor and some aldermen of Borgarello, we reached no more than 20 participations. Such a pity! The member of the European Parliament showed us many different aspects of our citizen’s rights, italians and foreigners. Furthermore, she spoke about the various projects for development and goods exchange promoted by Europe in underdeveloped countries of Africa. Specifically of the “committee of control” of which she is member. Basically, EU gives funds for many kinds of projects, that can involve reconstruction, soil rehabilitation, culture or something else; the committee has to go in a determined country and control that money is actually spent only for that project, and for nothing else. She used Congo, her country, as an example, since it is by now scene of a terrible crisis due to big lobbies and, mostly, China. The South in particular is victim of this crisis, because of its high concentration of cobalt, a mineral that has become fundamental for all of us, being it a ferromagnetic element that is used for creating the batteries of our precious smartphones. Not only, its importance is even higher if we take a look at industry 4.0, that has the aim of spreading the use of electric car on a mass scale, eliminating this way the use of oil in the western world. Is the elimination of pollution so important to us that Africa has to pay for it? If things are going to stay this way, the answer is yes. Human impact is more than visible: miners digging without any security device; some dozens of thounsands are regular, hundreds of thousand are undeclared, usually working for chinese companies to sell their cobalt. You have to consider that in some case these workers, that are also fathers, dig all day without finding a single gram of cobalt: these are days that don’t get paid. The scenery gets even more obscene when these workers are children. Unicef has stated that 40.000 congolese children are working in cobalt mines. And it seems that they’re preferred to adults, since their pay can be lower. Compared to the 2 dollars that adults get per day, they only get 90 cents. The age of these little workers goes from 8 to 14 years old. This drama brings other problems within itself, such as mass migrations of people who want to find the western and chinese treasure, and a considerable geological damage, due to mines that made the soil extremely fragile. There is another damage that involves the native tribes that get pushed away, doesn’t matter which way. The cobalt crisis started some years ago and the dynamics seem to get worse, considering that our demand will double by 2020. Meanwhile, royalties on mineral extractions have already increased, together with taxes that companies will have to pay, by the will of the President of Democratic Republic of Congo, Joseph Kabila, who seems to ignore the situation in which his people are struggling. The european committee suggests a solution with traceabilty certificates. But, by now, they’re just suggestions. Meanwhile Amnesty has inquired about what are the giants of the technological industry that are collaborating with industries that respect human rights. The date show that only two among the dozens inquired have decided to follow a marketing strategy that is respectful of ethics, and they are Apple and Samsung. Other ones, such as General Motors, Volskswagen, Microsoft, Lenovo, Renault, Huawei did almost nothing to control the problem. The biggest part of this situation is China’s property, that has the role of colonizer, again, in the african continent. Cècile, together with other european deputies, is working in order to create a deal with which no country will be forced to undergo this kind of situation. There is a long and difficult way to go, and we know that the mechanisms that are moving great industries are almost unstoppable. Nevertheless, there is an important matter that you just cannot ignore: human rights, that need to be respected in every single place on Earth, even the most remote.